Take a break from your Christmas shopping and gift wrapping and visit the the annual Basilica Museum Christmas exhibit "Away In A Manger" in the Basilica Cathedral Museum in St. John’s. Every Christmas, I look forward to volunteering at the Basilica Cathedral Museum and providing interpretation to visitors of this cross-cultural exhibition. I am here today, between visitors typing a post and listening to pre-recorded sounds of Shallaway and Gordon Pinsent reading "A Childs's Christmas in Wales" filling this historic hall. 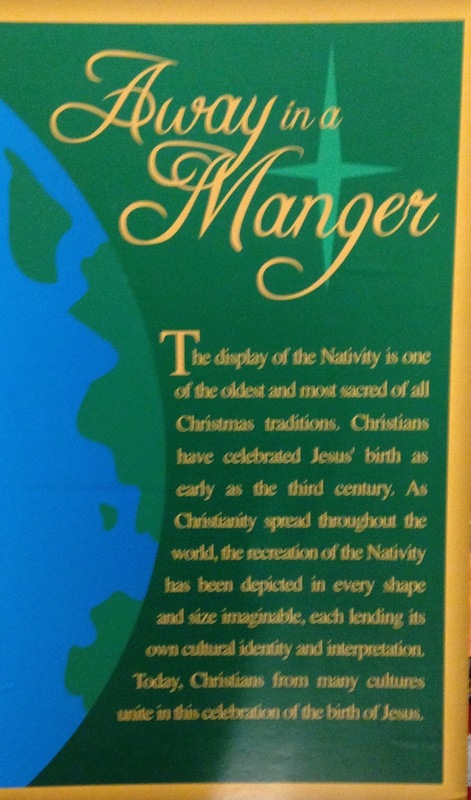 The exhibit features over 100 nativity scenes from around the world. Different parts of the world have different traditions when it comes to creating and displaying their nativities. Every region of the world has added their own cultural flair to them. “Away In a Manger” is in it’s 13th year featuring figurines in African nativities looking more like various tribe members and native American nativities celebrating our Christian cultural. St. Francis of Assisi gets credit for creating the first-ever recreation of the Nativity scene. He felt that the meaning of Christmas was becoming lost as people appeared to be were more focused with on gift giving them they were of the true message of Christmas. Sound familiar? Determined to remind people what Christmas is really about, he set about creating the world’s first known Nativity scene to help tell his people of The Nativity Scene. It was created in 1223 in a cave and near Greccio, Italy, and involved real people and animals, making it a living Nativity scene. Nearly 800 years later the Nativity Scene has become a reminder of the true message of Christmas. 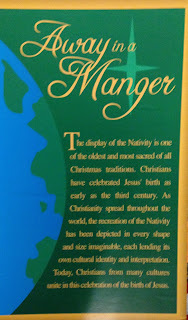 The exhibit will be on display until noon Christmas Eve.I should note that the museum is closed on Mondays. Bring a gift to place under the Christmas tree, your gift will be given to a needy family this Christmas. For more information, call 726-3660.